This idea occurred to me several years ago when I was worrying about some of the outside animals around here. You see, I am pushover for cats and dogs that wander into my little corner of the world, and I think they all know it. I try to feed and take care of them to the best of my ability, and they in turn keep coming back for more. Several of the cats would huddle up on the back porch and while this did provide them some shelter, I thought I probably could do better. Now the local pets stores could provide really nice, cute house type structures for small cats and dogs, but these average 40$ and up. I needed an alternative. A similar size plastic box that I could modify easily seemed like the answer. The solution is the large plastic storage containers that you can pick up from the local discount store for less the 10$ typically. The model I selected was 32"x16"x16, green in color with a lid that snaps on. 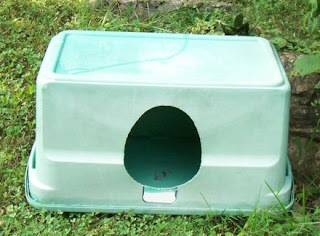 Bigger or smaller containers are available, but this one provides enough space for 2 adult cats, along with some bedding material. Pick the size that suits your animals best. There is not much to do to this shelter other than cut a opening sufficiently large for your pet to enter and exit, but not so large as to provide more draft than necessary. I settled on a opening that is about 8"x10" and egg shaped. I selected the shape because I happened to have a mouse pad of that description that I could trace easily for the cut. Other possibilities, Frisbee, dinner plate, picture frame, or just free hand it... you get the idea I am sure. You should probably place the opening centered on either the broad size of the container or the narrow side, keeping in mind the location of where you will place the pet shelter. I chose the broadside as it would be laid longwise along my back porch. With your favorite cutting tool ( I went with the Swiss Army Tinker ) remove the opening, sand the edges smooth if necessary and your about done. Place some bedding material in ( an old pillow case stuffed with rags, cedar shavings etc.) and that should about do it. I chose to set the container upside down, but you could orient yours right side up if you prefer. When you do decide on the way you wish place the shelter, you might also add a few small drain holes to the bottom, to provide drainage should it take on any water. A plastic flap can be added at the opening, slit up the middle and duct taped to the inside if you would like to provide a little more shelter from the wind and rain. This has worked well and held up to outdoor exposure for several years now, and I expect it will last much longer. You could add a little paint perhaps if you wanted to spruce it up some or personalize it a bit with Fluffy or Fido's name. By now you should have your own ideas on what will work best for you, so implement any variations that will work for you.